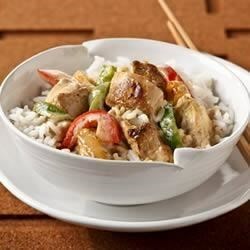 "Chunks of chicken breast and sliced onions are sauteed in flavorful Thai green curry paste, then cooked in a creamy sauce made with cream cheese and sliced red and green bell peppers. Serve over hot cooked rice." Heat oil in large nonstick skillet on medium heat. Stir in curry paste until well blended. Add chicken and onions; cook and stir 6 to 8 min. or until chicken is done (165 degrees F). Stir in red and green peppers; cook 4 to 5 min. or until crisp-tender. Add cream cheese, milk and white pepper; cook until cream cheese is melted and evenly coats chicken and vegetables, stirring frequently. Substitute: Prepare using red curry paste. Keeping It Safe: When thawing frozen chicken, place in refrigerator, allowing about 5 hours per pound of chicken. Never thaw chicken at room temperature due to the risk of bacterial growth. This was awesome. I used red curry paste and doubled the milk, cream cheese and white pepper.